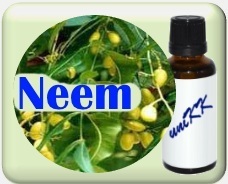 Neem Oil - the herbal remedy for pets! The anti inflammatory and pain relieving activity of neem make it potentially useful for pet medication against scalp psoriasis, eczema, seborrheic dermatitis, and yeast infections. Neem is a proven anti-inflammatory that decreases histamine and other mediators of inflammation in the body. It’s native to eastern India and Burma and has been used for medicinal purposes and pest control in India for thousands of years. Insects would rather die than eat plants treated with neem oil. Neem biodegrades in a matter of weeks when exposed to the sunlight.